Aesthetic experience was problematic for Enlightenment authors. 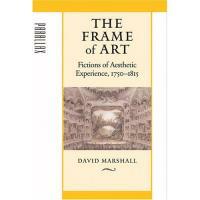 Arguing against the commonly held view that aesthetics in the eighteenth and early nineteenth centuries was defined by the professionalization of criticism and the disinterested contemplation and evaluation of the work of art in isolation, David Marshall seeks to understand how and why aesthetic experience in fact often generated tremendous emotion and tension. Focusing on stories about art told in literary, critical, and philosophical writings, in which art is represented as both powerful and disconcerting, he demonstrates how an aesthetic perspective blurs the boundaries between art and reality rather than separating them. Lucid and erudite, The Frame of Art examines an Enlightenment preoccupation with the pervasive presence of art and aesthetic experience in everyday life. Viewing a world composed of images, simulacra, copies, reenactments, performances, paintings, and texts, authors and characters describe and enact – in what Marshall describes as a "representation compulsion" – intense experiences of art that are far from the disinterested museum experience typically seen as the endpoint of eighteenth-century aesthetics. These insightful readings of Charlotte Lennox, Jean-Jacques Rousseau, Gotthold Lessing, Lord Kames, Henry Mackenzie, David Hume, Jane Austen, and the theorists of the picturesque trace the dramatization of aesthetic experience and the desire to design one's life as if it were a work of art-a painting, a play, or a novel. Marshall asks what it means for these authors to view the world through the frame of art.